Dan Waldstein graciously shared his report of a full game of FWtBT using a variable beginning of the revolution. The biggest upset during the start of the game was that Valencia also declared for the insurgency, and the Spanish Republic never recovered from that. In September 1937, all was over. How it happened, you can read here. We say thank you, and hope you’ll enjoy the read! Valencia revolting was the key to this game ending early. Loyalist forces were unable to link Catalonia with the rest of Spain AND were forced to divert forces to capture the city before being able to march on Zaragoza or adequately defend Madrid. My mistake of not using all 3 Italian task force counters at the same time in 1936 ensured the unopposed assault on Barcelona but I think that the scanty Loyalist navy would still have been swept aside in the last turn by the Italian fleets. As an FYI, the following regions of Spain saw no action whatsoever: Galicia, Castilla la Vieja, Leon, and Murcia. Those that saw limited action included Extremadura, Catalonia (except for one hex of Barcelona), Valencia (except for that city), Andalusia (except for the vicinity of Almeria) and Asturias (except for the quick reduction of Gijon). The bulk of the combat occurred in five provinces: Santander, Euzkadi, Navarre, Castilla la Nueva, and Aragon. 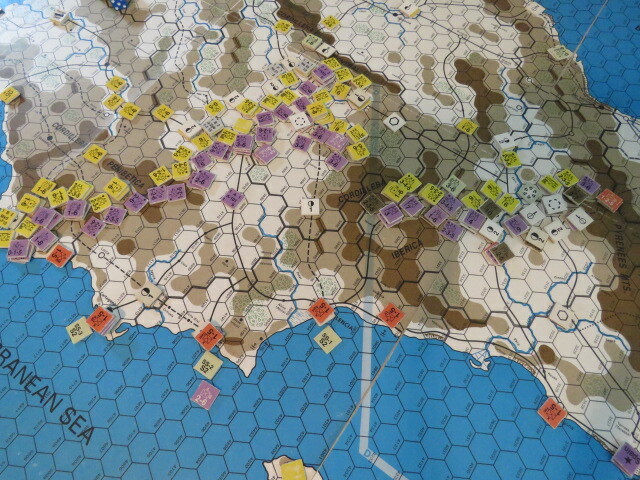 SEPTEMBER I – INSURGENTS – Taking a chance to end the game quickly the Insurgents launch an amphibious assault against the main hex of Barcelona, supported by naval gunfire and air strikes from Zaragoza. The city, home to both the Loyalist Government and factories, is only defended by local militia and an Anarchist brigade. The assault goes in at 2:1, minus 1. An Ex result occurs eliminating the entire defensive force and capturing the Loyalist government. 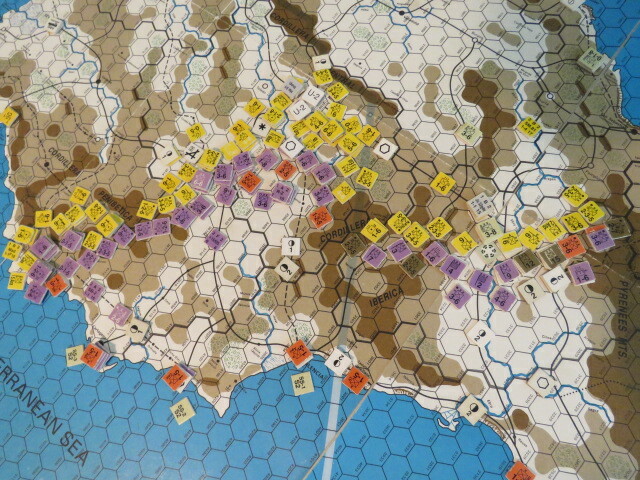 Since both hexes of Madrid are in Insurgent hands, the game ends immediately. AUGUST I INSURGENTS – Madrid falls, albeit with a 4:1 – 2 EX result; but the Insurgents did capture 3 steps of badly needed attack supply. At least the Loyalists went down swinging. 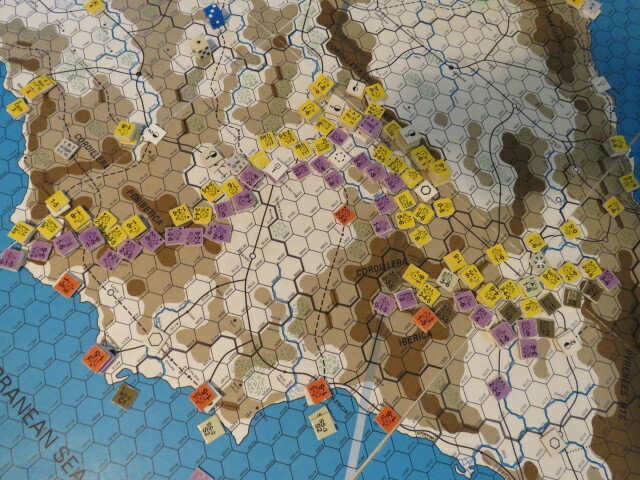 Another victory outside of Zaragoza and one east of Almeria made this a watershed turn. Can’t wait for the 13 divisions it took to reduce the city to turn south and see how far they can push before Mud. AUGUST I LOYALISTS – Where to defend and when to retreat is the recipe for survival. Still no Revolt in Barcelona so they have that going for them. A little digression here. I should just pack this in but a perverse sense of “what if” is driving me on. What if Franco succeeds in late 1937? Would a Spanish Civil War that lasted a little more than 1 year mean a quicker recovery than one that lasted nearly 3 years? Would his demands of Hitler (assuming Franco would even honor them if agreed to) for support and French territory in Africa been less severe? You know, more like going to the dentist to have some teeth filled, but not pulled. Personally I think Franco could read maps and see how naked he would be while Great Britain ruled the waves. All of that coastline to defend could have given Franco a readymade excuse even IF Adolf agreed to his armaments, petrol, food, etc. demands. 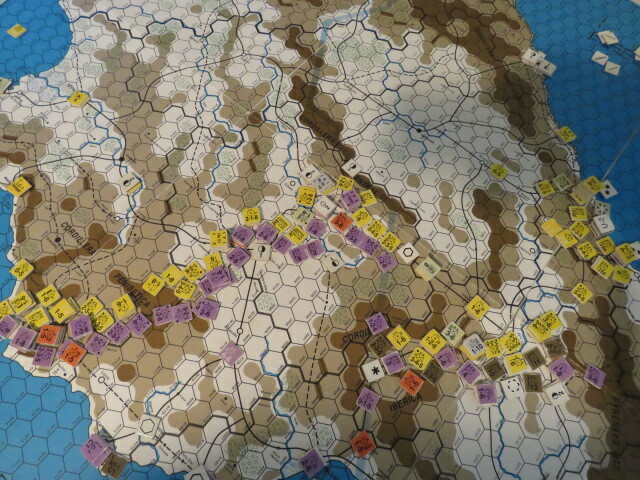 AUGUST II – INSURGENTS – An attack south of Madrid clears the Tajao River line and an Ex result with all Italian forces takes another hex southwest of Zara. Elsewhere ponderous corps are moved into position in western Castilla and in Aragon for the big pre-Mud push. AUGUST II – LOYALISTS – No good options for counter attacks so beefing up the line is in order. The Loyalist dead pool right now sports 15 divisions of all affiliations and another 40 or so regiments or brigades. In contrast not only do the Insurgents have about 30 infantry replacement points but the only forces in their dead pool are the recently deceased Italians and a few artillery regiments. JULY I INSURGENTS – Madrid cut off from the rest of Spain. A very productive Insurgent turn that resulted in the destruction of 3 Loyalist corps. The only negative was an AS result southwest of Zaragoza. JULY I LOYALISTS – Major line patching occurs and rushing reinforcements and replacements to the front. The prospects of relieving the siege of Madrid are nil. JULY II INSURGENTS – Success outside of Madrid reducing the pocket, now at U-2, even further. Revenge in Aragon for that AS last turn. This time an Ex rolled that pretty much decimated the non-Italian forces (need them to hang around for the Aug II conversions). JULY II LOYALISTS – Dig in and await the inevitable onslaught in Castilla and Aragon. Feel like I’m rearranging deck chairs on the Titanic as my reserves scurry about plugging holes in the lines. All rail capacity (all 8 RE) needed for doing just that and the only good news on the logistics front is the front itself is getting closer to multiple replacement cities. JUNE I INSURGENTS – The noose tightens around Madrid after 3 hexes are taken and another seized during exploitation. The first counterattack in ages occurs northeast of Zaragoza with the Italian legions leading the way. JUNE I LOYALISTS – Strictly defensive measures as Insurgent stacks in Castilla and Aragon are too strong to muster decent (greater than 2:1) odds. Resource points rushed to the front and a pull back from around Almeria keeps another stack from being out of supply. JUNE II INSURGENTS – Increasing pressure on the Loyalist lines southeast of Madrid and northeast of Zaragoza result in advances and losses. Alcazar de San Juan recaptured (HX). A slow but steady attrition of air assets, on both sides, continues. Insurgents have 3 eliminated and 2 aborted; Loyalists have 5 eliminated. JUNE II LOYALISTS – An attempt to regain a lost hex south of Madrid fails (AS) but some progress (DR) in the valley north of Teruel. Continued feverish fort building. VICTORY POINTS: INSURGENTS 182/LOYALISTS 77; still a Marginal Victory for Insurgents. MAY I INSURGENTS – The last pocket of resistance in the north is liquidated by Italian forces (medals all around) while a dozen divisions converge on Castilla from the West, North and East. A light tank division is formed from all mech forces supported by a 4-6 artillery brigade (10 factors attack and defense). Supply forwarded to Andalusia in hopes of capturing Almeria next turn. No other actions taken. MAY I LOYALISTS – Again they get their clocks cleaned in aerial combat over Castilla (2 eliminations and an abort to only an abort for the Insurgents). Despite massive attack supply for two assaults the results are dismal: one is an AS the other a DR. They are creeping closer to taking back Aranjuez but there’s still those dozen or so divisions getting into position to push them back. MAY II INSURGENTS – In 5 attacks Franco’s forces manage a DH, DR, DR (with loss due to ZOC) and two DEs. Loyalist losses total 5 division equivalents. Barcelona wants to know why they can’t those kinds of results. These attacks clear out the wooded rough east of Madrid and a few hexes along the rail line in Castilla and take Almeria. Elsewhere, and this is the sad commentary on the disparity of forces, the Insurgents pulled enough regiments out of line to be able to form all 6 divisions next turn! MAY II LOYALISTS – A desperation 3:2 attack on Aranjuez leads to disappointing results (AS). Elsewhere some contraction of the lines in Castilla and with eight more turns of clear weather there’s not much for the Loyalists to be sunny about. 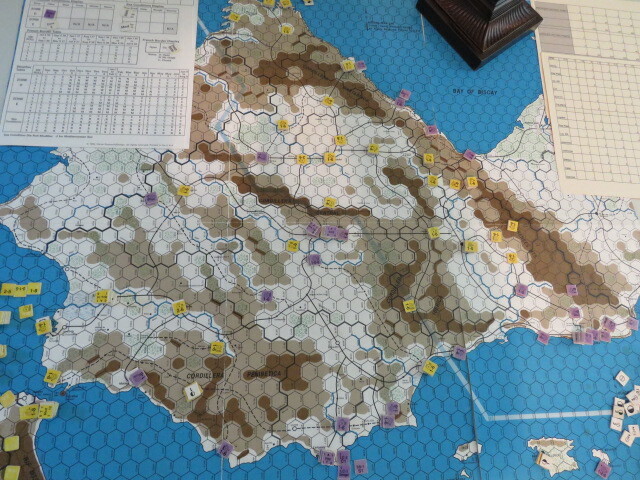 APRIL I – INSURGENTS – Mud/Clear – Seizure of the hex immediately west of San Sebastian spells doom for that Gobernito as the Basque territory is now split in two isolating a 6 brigades in a pocket and leaving only 1 2-3-4* and a handful of brigades around San Sebastian. 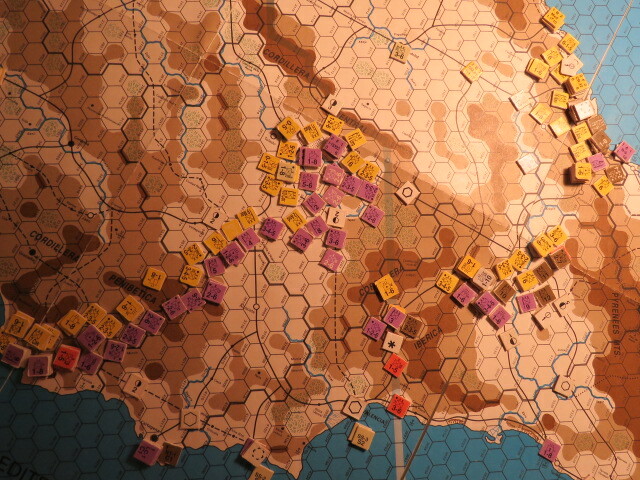 In the south the line in Castilla is reinforced and despite the clear weather Franco decides to wait until after things are finally settled up north to make any further moves there. APRIL I – LOYALISTS – In a surprise move a massive 3 corps attack captures Alcazar de San Juan, albeit at the loss of 2 divisions. 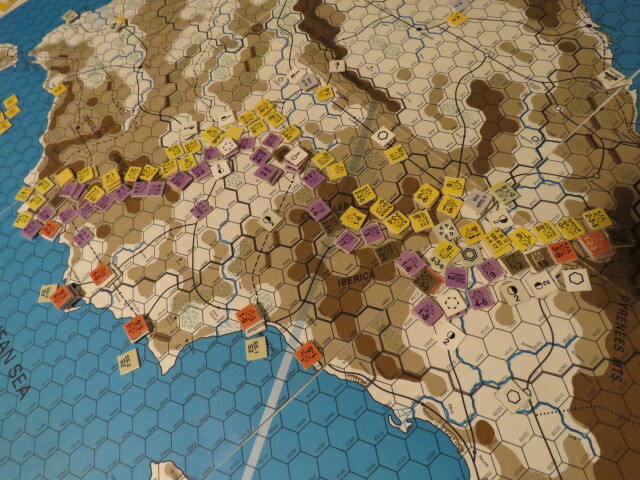 Now 3 divisions and an armored brigade stack sit on the vital rail junction. An International division comes into being southeast of Madrid and a corps pushes north from Teurel. All Basque forces that can move retreat into San Sebastian forming a corps with a defensive strength of 13, including city garrison. APRIL II – INSURGENTS – Clear/Clear – Goodish news and baddish news. San Sebastian falls but with a loss of 13 attack points in the Ex result; the attempt to take back Alcazar with a 3:1 – 1 attack results in an AR. Gaping hole in the line through which, no doubt, about a dozen Loyalist divisions nearby can exploit and/or assail the 10th Corps and widen the life line to Madrid. APRIL II – LOYALISTS – Half the Basque forces in the pocket quit and go home. In Castilla influx of divisions and additional forces to capitalize on Insurgent AR result yields 3 more hexes of that province. Another International division built and more creeping up the valley north of Teurel. MARCH I – INSURGENTS – Mud/Mud – Supplies, assault divisions, artillery, and engineers are moved to forward positions around Bilbao. Since Madrid forces will be at half strength it seems better to clear the North first. 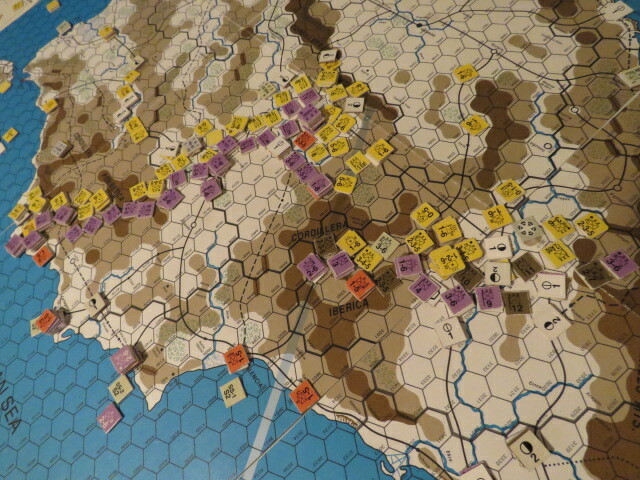 MARCH II – INSURGENTS – Mud/Clear – While poring over the maps Franco sees self-supported Basque divisions inching their way westward and decides mud be damned it would be better to attack a stack of 15 in the mud vs. 20+ in the clear. So a 4:1 – 3 attack against Bilbao goes forward with a DR result. The Basque units successfully retreat to Guernica. Two other attacks each destroy a Basque division and suddenly the Basque territory is nearly split in two. These actions included the largest air offensive of the war and it was equally bad in the air for the Loyalists: 3 units eliminated and 1 aborted; Insurgents had both H-51 units eliminated. Elsewhere forces in the mountains near Teurel retreat into that city to avoid a U-2 rating and a 3:1 Ex result attack occurs south of Madrid. 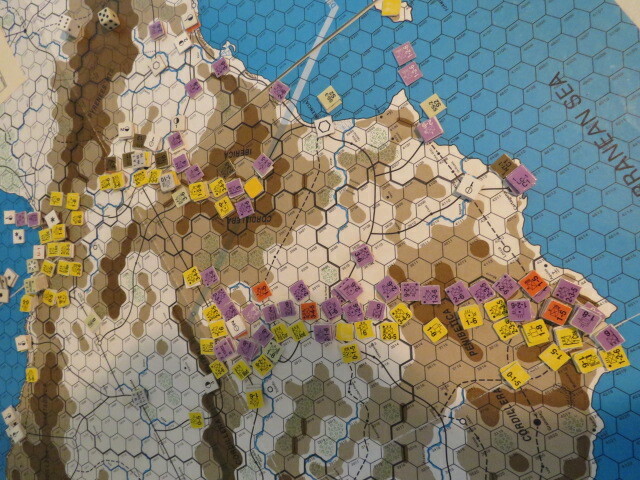 MARCH II – LOYALISTS – Panic mode up north as troops desperately scramble to shore up the lines outside of San Sebastian and others retreat eastward towards that lone outpost. 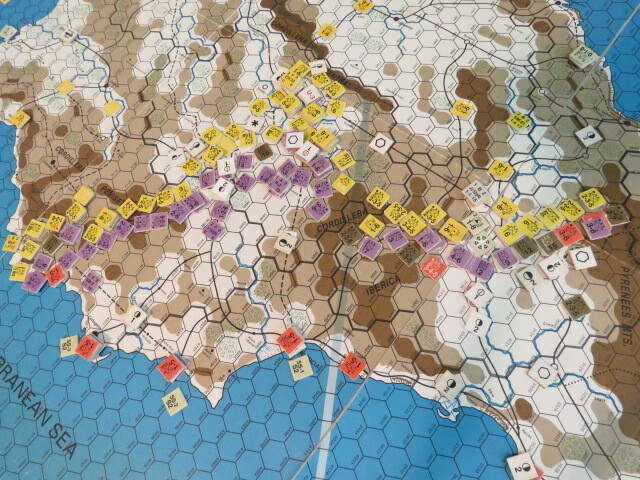 In the south a 3:1 attack reclaims the hex south of Madrid seized by the Insurgents and results in the complete destruction of that rebel corps. FEBRUARY I – INSURGENTS – Never so happy as to get Snow/Mud this turn – just for the change of seasons! – Seized Mahon (and wrecked AMP in the process); mostly pulling back of lines in the south to stay in supply. FEBRUARY I – LOYALISTS – With Mud, as predicted, no easy targets for attack in the South. 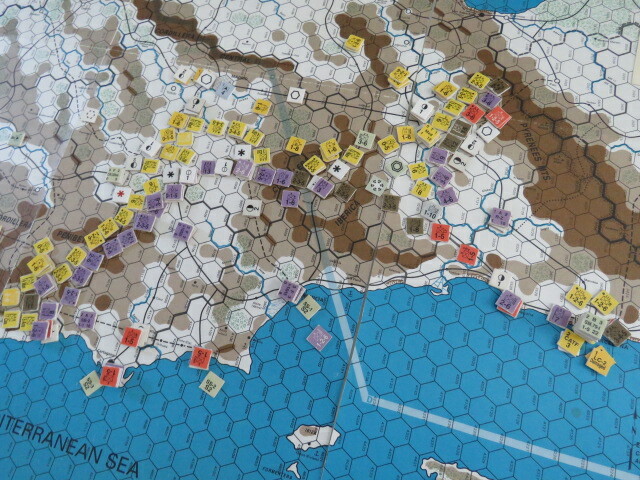 An attempt to seize a hex southwest of Zaragoza failed (AS). Fort in Almeria completed and linkup between San Sebastian and Bilbao realized. Some redressing of the lines in western Murcia to remain in supply. Taking advantage of the Mud die roll modification the government relocates to Barcelona where, it is noted, it’s only a short drive to France. Even though the modified defensive strength in Madrid is 7 the government assures the populace that the large negative die roll modifiers due to weather, fort and urbanization makes Madrid safe until April. 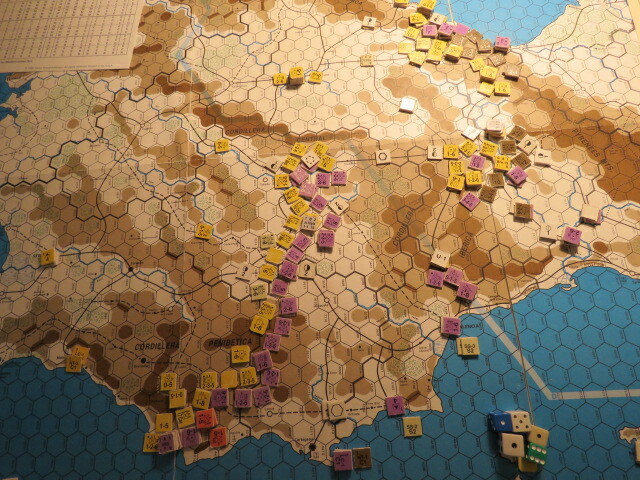 FEBRUARY II INSURGENTS – Winter/Mud – Taking advantage of failed Loyalist attack near Zaragoza the rebels assault and eliminate a surrounded (on 3 sides) hex of socialist rabble (their words, not mine). Upgrades to Requete forces accomplished and just waiting to crush the Basques. FEBRUARY II – LOYALISTS –More slow shuffling of troops towards forward positions in anticipation of spring offenses. Government settles in nicely into their new residences in Barcelona not too far from the coast and just off La Rambla.